Yields: 2-3 dozen Amazeballs depending on how big you roll them. 1. In a large bowl, crush Rice Krispies (I use my Blentec, if you don't have a blendtec feel free to use a food processor, your clean hands or a wooden spoon). 2. Add peanut butter and softened butter to the bowl and mix thoroughly until the Rice Krispies are well mixed. 3.Begin adding powdered sugar to the mixture 1/4 pound at a time and stir well. Keep adding sugar until all of it is mixed into the Rice Krispies/peanut butter mixture. 4. Roll the mixture into small balls and refrigerate for 1-2 hours. 5. Heat the melting chocolate according to directions in a saucepan over low heat until all chocolate is melted. 6. 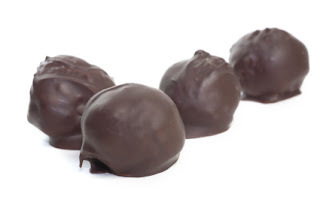 Roll the peanut butter balls in the melted chocolate and place on wax paper to dry. Perfect treat for family game night!